The increased prevalence of chronic diseases and the rising geriatric population has led to the high demand for better medicines and facilities. For the continued and improved care of the patients, the drug infusion systems are being extensively used in the hospitals as well as the home care settings. As per the Arthritis Foundation, the older population in the U.S. affected by arthritis is estimated to grow to 21% by 2040, from the current value of 15%. The rising prevalence of chronic diseases is another factor contributing to the growth of the market. In the recent years, the prevalence of chronic diseases has been increasing irrespective of the age. As per the World Health Organization (WHO), the global prevalence of diabetes increased to 8.5% in adults over the age of 18 years in 2014 from 4.7% in 1980. The prevalence of genetic diseases, and cancer has also witnessed a rise in the recent years. As per the U.S. FDA an infusion pump is a medical device that delivers controlled amounts of fluids such as nutrients and medication. The drug infusion systems market includes various infusion systems products including the components such as pumps, accessories and disposables. The market includes several products such as large volume pumps, enteral pumps, syringe pumps, insulin pumps, elastomeric pumps, Patient controlled Analgesia (PCA), ambulatory pumps, and implantable pumps, among many others. These devices are being used for the administration of fluids and medication to a number of diseases, and therapeutic areas such as diabetes, analgesia, nutrition, haematology, oncology and paediatrics. The market analysis includes an in-depth examination of the key ecosystem players, and the key strategies and developments taking place in this market. Additionally, it includes market dynamics (market drivers, opportunities, and challenges), and industry analysis. The purpose of the study is to gain a holistic view of the drug infusion systems market in terms of various factors influencing it such as recent trends, technological advancements, and regulatory aspects of the market. The scope of this report is centred upon conducting a detailed study of the solutions allied with the drug infusion systems market. The market has been segmented into ‘product’, ‘application’, ‘end users’ and ‘geographical regions’. The report presents the reader with an opportunity to unlock comprehensive insights with respect to the market, and helps in forming well informed strategic decisions. The research uncovers some of the substantial parameters that must be taken into the consideration before entering the market. This research report aims at answering various aspects of the global market with the help of the key factors driving the market, threats that can possibly inhibit the overall market growth, and the current growth opportunities that are going to shape the future trajectory of the market expansion. The study considers the growth-share matrix model for a comprehensive study of the global drug infusion systems market, and assesses the factors governing the same. • What are the major market drivers, challenges, and opportunities in the global drug infusion systems market? • How did the drug infusion systems market evolve, and what is its scope in the future? • What is the market share of the leading segments, and sub-segments of the global drug infusion systems market in the period 2016-2025? • How will each segment of the global drug infusion systems market grow during the forecast period, and what will be the revenue generated by each of the segments by the end of 2025? 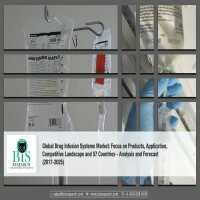 • What is the infusion systems market value in different countries of the world? • What will be the growth rate of the insulin infusion systems during the forecast period? • Which product segment is expected to register the highest CAGR for the drug infusion systems market? • How has the market been segmented on the basis of application? Which application segment has the largest share, and growth rate in the drug infusion systems market? • How the homecare segment among the end users will grow in the period 2016-2025? • Which geographical region will contribute to the highest sales of drug infusion systems? The key players that have been contributing significantly to the drug infusion systems market are Becton, Dickinson & Company, Caesarea Medical Electronics Ltd, Debiotech, Medtronic, Flowonix Medical Inc., Fresenius SE & Co. KGaA, ICU Medical, Insulet Corporation, IRADIMED CORPORATION, MOOG, Smiths Group, Tandem Diabetes care, and Terumo Corporation, among others. 9.5. Caesarea Medical Electronics Ltd.
9.16. Tandem Diabetes Care, Inc.
9.19. Snapshot of Other Key Players: Ivenix, Inc. The increased prevalence of chronic diseases and the rising geriatric population has led to the high demand for better medicines and facilities. As per the Arthritis Foundation, the older population in the U.S. affected by arthritis is estimated to grow to 21% by 2040, from the current value of 15%. The rising prevalence of chronic diseases is another factor contributing to the growth of the market. In the recent years, the prevalence of chronic diseases has been increasing irrespective of the age. As per the World Health Organization (WHO), the global prevalence of diabetes increased to 8.5% in adults over the age of 18 years in 2014 from 4.7% in 1980. The prevalence of genetic diseases, and cancer has also witnessed a rise in the recent years. For the continued and improved care of the patients, the drug infusion systems are being extensively used in the hospitals as well as the home care settings. The U.S. FDA defines an infusion system as a medical device that delivers controlled amounts of fluids such as nutrients and medication. The purpose of the study is to gain a holistic view of the drug infusion systems market in terms of various factors influencing it such as recent trends, technological advancements, and regulatory aspects of the market. The scope of this report is centred upon conducting a detailed study of the solutions allied with the drug infusion systems market. The market has been segmented into ‘product’, ‘end-users’, ‘application’ and ‘geographical regions’. The global drug infusion systems market can be segmented on the basis of product into large volume pumps, enteral pumps, Patient Controlled Analgesia (PCA) pumps, syringe pumps, insulin pumps, ambulatory pumps, implantable and others. The major contributor towards the market in 2016 was the large volume pump systems. Based on the application type, the market is segmented into diabetes, oncology, analgesia, nutrition, haematology, paediatrics, and others. On the basis of end users the market can be segmented into hospitals, homecare, ambulatory surgical centres and others. The market for the home care is expected to reach $1,457.1 million by 2025. Based on the regional segmentation, the largest contributor to the growth of the global drug infusion systems market in 2016 was North America due to the presence of positive government regulations and reimbursement policies apart from the rising elderly population followed by Europe. The highest CAGR was estimated for the Asia-pacific region because of rising healthcare expenditure and increasing patient awareness. Drug infusion systems provide safe, accurate and precise drug delivery. The market is expected to grow in future due to technological advancements, higher demand in the developing nations, and increased usage across different therapeutic indication. The report provides in-depth SWOT analysis of different key players of the market, supported by extensive financial summary of each. The key players for the market are Becton, Dickinson & Company, Caesarea Medical Electronics Ltd, Debiotech, Medtronic, Flowonix Medical Inc., Fresenius SE & Co. KGaA, ICU Medical, Insulet Corporation, IRADIMED CORPORATION, MOOG, Smiths Group, Tandem Diabetes care, and Terumo Corporation, among others.